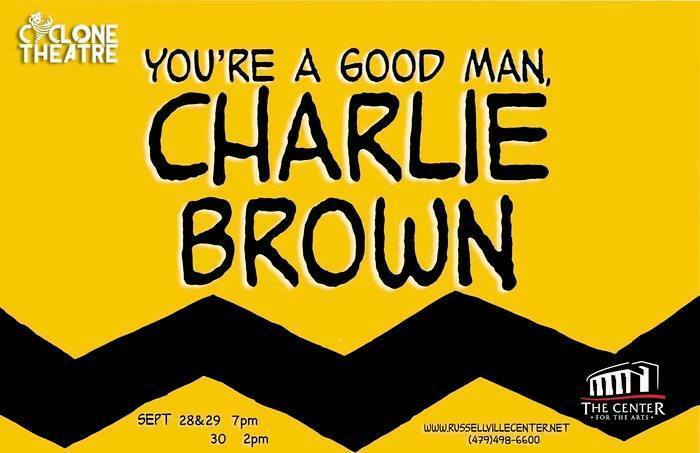 Russellville High School Cyclone Theatre will present "You're A Good Man, Charlie Brown" on September 28 and 29th at 7 pm and September 30th at 2 pm at The Center for the Arts. This fun-filled musical highlights a day in the life of the beloved Peanuts characters by Charles Schultz. Linus totes his blanket as Lucy pines after the Beethoven-loving Schroeder, Sally explains her philosophy of life while Charlie Brown laments about baseball and Snoopy begs for Suppertime! Tickets are $10 for adults and $5 for students. Contact The Center for the Arts box office at 479-498-6600 for ticket information.